Safely store your products with this Cambro 22SFSCW135 22 qt. square food storage container! This food storage container is made of crystal clear, virtually unbreakable polycarbonate that won't be stained or harmed by food acids, oils, and alcohol. Thanks to its square shape, this container can be conveniently packed onto shelves without wasting space, while its clear construction and easy-to-read winter rose gradations allow you to manage your inventory at a glance. Tired of messing around with large bags of flour or sugar, etc.? This will ease your frustrations. Easy to see through, easy to clean, easy to use. I purchased this to replace a 12L Rubbermaid. This is a lot more solid and feels that it will last longer than the Rubbermaid did, which barely lasted 7 months before it started developing cracks. This is the brand that the restaurants *really* use, and I feel confident that it will hold up to occasional sous vide cooking more than the other product. So far, very satisfied with the item. We use this plastic 'food container' to brine various meats in preparation for smoking. The container might hold something as large as a 19-23 pound turkey but not too much larger. All i can say is these are the best all around containers to store dry food in. I use these for flour, sugar and rice. Very sturdy and has nice handles. Great size cambros to store fresh spring mix for salads, or large quantity of sauces like salad dressing or spicy mayo. Very versatile must buy the lid that is not included to maximize usage. Very Sturdy. We use it to store large batch of salad mixture, quiche mix, Ice tea. Stacks nicly. The product label stick nicely to it. I like cambros and this is not an exception but it arrived with stickers on it that are huge and didn’t come off cleanly. Otherwise these are great and i bought them with the blue lids. We use these tall slim cambro containers to store dry goods like pasta, nuts, lentils. I like that they are crystal clear, easy to clean and sanitize. They make everything look neat and tidy. I've always been a fan of Cambro brand. These are excellent for holding stocks and large batches of soup. I also use them for storing dry storage ingredients such as rice and flour. The lid keeps the ingredients dry and safe from dirt. Solid piece of equipment. Feels tough and durable. I only bought this one as a backup. My original from 2 years ago is still holding strong with daily use. These are more easily stored around the kitchen than the round containers. This is a great solution for marinating a lot of meat at one time. Great container. Excelent for storing large amounts of bulk, namely flour. This will fit a 10kg flour bag with a lot of room to spare. The handles on the side will allow ofr easy handling when full. This container is exactly what I was looking for for my sous vide cooker. I was worried that it would be too deep to work correctly but it works fine. I used red food coloring to see if it mixed alright and it was even colored within a few seconds. Containers are strong and hold up well to every day use. The handles on the sides are great for carrying them when they are full of food. We use these in the restaurant to store everything from chili to flour. They are well worth the cost. They clean up nicely... no stains, no odors, and they seem pretty close to indestructible. I’ve never seen one crack and some have been in use for nearly a decade. I was introduced to the 12 qt cambro and the result was a loss of star. I feel ashamed to do it though. It had to be done. These are 4 stars because the 12 qt version is just that much better. ALSO keep in mind that your metro racks in the walk in better be tall enough to fit these!!! This Cambro containers are the best quality out there. They are neat, great looking and strong/durable. I used them for both my restaurant and home. Plus they arrived quickly. Highly recommended! Beautiful clear storage containers for the food in the restaurant when we received these containers it felt so blissful to actually receive them and dispose of the other ones. Our guest love when they see us take out these containers and fill up the food trays. They like seeing the clean look that they give off. Cambro makes the best containers by far! Easy to use lids which snap on and keep the container secure. Great for storing dry goods such as flour and sugar. I absolutely love these Cambros. They are perfect for soups, salads, dressings, pretty much anything you can imagine. They are clear, so you can see everything at a glance and can even measure in it with the guidelines. You can never go wrong with cambro! These work perfect for holding anything and the Cambro lids that you can purchase for them create a very tight seal. You might not want to save a few dollars by ordering inferior knock-off items. I use this cambro for pizza flour, pastry flour, sugar, and I even bought one for brining turkey at Thanksgiving! The markings on the side help you for liquids too! A must have in any kitchen. These 22 quart cambros' are perfect to easily store any stocks, sauces or soups. Clear design makes it easy to see inside, fits in any size dishwasher for easy clean up and doesn't take up to much room in your walk in. The cambro's are perfect for all sorts of uses. Storage, prep items, poultry, etc. They are also very durable and clean easily. Recommend for all to use. Can't live without these, excellent container for storing just about anything. And they are heat resistant so you can put hot soups or stock in them. We purchased this storage container to store our brown sugar. It is nice and large to hold the 25 lbs. we purchase at a time. Love the clear buckets easy to see the what items are in it, they fit neatly on the shelves, nice size, sturdy and great for when you're taking quick inventory. This is a great container, just make sure you buy the right top for this. The clear plastic top, not the blue one, will be the correct one. Good quality and construction. I have purchased dozens of these over the years and they work much better than round containers. Easy to stack and store. This container fits in conjunction with the Cambro 22 Quart lid. I like this brand because they stack on top of eachother nicely. This size is good for stocks. Like all of the Cambro products that I have been happy to purchase this 22qt. Food storage container is no different. It is built to last! Fantastic food containers. We use this size for our staple items such as bulk flour, brown sugar, cocoa, rice, and more. Handles make this easy to move around. Material is very sturdy and easy to clean. These clear cambro food storage containers are excellent very good for storing all types of foods and liquids excellent quality lids fit nice and firm easy to handle for carrying - I would highly recommend them for any food service operation. These storage containers are prefect for large quantities of food. We have no problems with them. They are easy to clean as well. I highly recommend this product. I love the fact that these are completely clear. The 22 qt is truly huge, perfect for brining and prepping or storing high volume ingredients. They are solid, easy to see what's inside, and the lids fit tight. The size is a bit awkward if you're used to 8 qts, but otherwise great product! Very tall item. High shelf space is an absolute must! Does as you would expect and stores food properly and doesn't absorb any odors. Good buy for sure! Perfect size for large quantities of food. The handles make them much easier to carry. One of our most used containers for soups, chilis, and stews. We use the 22 quart cambros in our bakery to hold various doughs and starters. It's a perfect container for small batches and stacks well in the walk in. The 22 quart clear polycarbonate food storage container works and looks great. Some customers must have the Cambro line and will pay more for them. Cambro always makes a great product. These are very durable and stack easily. There is an area for labeling and they are clear so it is easy to distinguish products. These are top of the line! They are the best in quality, performance, durability, viability, and everything else one could ever want in a storage bin. Cambro Clear Food Storage Containers are the ONLY food storage container that I buy. Strongly Recommend! Excellent product at an unbelievable price. These containers are great to store soups & stocks in. Also useful for iced beverages. They store well thanks to the shape. Cambro storage containers are unmatched! Extremely durable and versatile, they make for a sanitary organized walk in! Cool down hot soups or sauces, perfect for high quantity businesses. Cambro is Cambro....Who does not love these? they are built to last and take the abuse. I wish all products held up as well as these. I love CAMBRO brand. 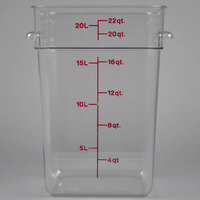 We use this twenty two quart container to measure water, flour, and yeast and to create starters for pizza dough and bread. I love cambro containers. They are so useful for many applications. The measurements marked on the side are easy to read and very durable - you can still see them after many washings. The containers are tough and hold up to our constant use. Excellant quality with great durabilty, I use these on all of our catering events.Cleans with a ease , pair this with the lids and you are set !